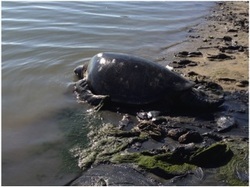 Green sea turtles (Chelonia mydas) have inhabited San Diego Bay since the mid-late 1800s and have been routinely observed in the SBPP outfall area since the 1960s (Stinson 1984, McDonald and Dutton 1990). During its operation, the South Bay Power Plant (SBPP) in Chula Vista, California discharged warm-water effluent into San Diego Bay in an area designated as a unit of the San Diego National Wildlife Refuge called South Bay. Turtles likely utilized the outfall area to take advantage of the significantly warmer water for thermoregulatory purposes. On December 31, 2009, two of the plant’s four generators permanently shut down; complete decommission of SBPP occurred on December 31, 2010. Closure of the SBPP has removed this non-natural source of warm water, often referred to as the “Jacuzzi,” and bodes the question of how green turtle movement and behavior in the Bay will change. Since 2009, Lewison lab members (Brad MacDonald and Sheila Madrak) have been tracking the local movements of green turtles in San Diego Bay through a collaborative effort with the NOAA Southwest Fisheries Science Center, the United States Navy, and the Port of San Diego. Green turtle movement is monitored using a combination of passive and active acoustic telemetry. The data collected via acoustic telemetry provides information with regard to how green turtles utilize the horizontal plane of their habitat. To monitor green turtle movement in the vertical plane, we use archival time-depth recorder (TDR) tags (see photo above). A TDR is temporarily mounted to the carapace of a green turtle to monitor the dive behavior of the turtle. Upon release from the animal, the TDR is collected and data retrieved from the tag. All tagging and tracking of green turtles in San Diego Bay is consistent with methods approved by the National Marine Fisheries Service (permit #1591) and the San Diego State University Animal Care and Use Program/IACUC.